Our dearly loved mom passed away peacefully with family by her side at the Bethany Care Centre in Calgary on Easter Sunday April 1, 2018 at the age of 77 years. 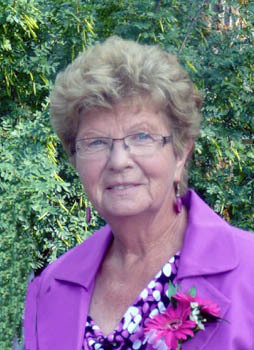 Doris is lovingly remembered by her children, Mike, Daryl (Wendy) and Lisa Bier (Don); grandchildren Tiffany Therrien (Josh), Tyler Lichti and Braydon Bier; and many extended family in Ontario. She is predeceased by her husband Ed (2005), parents Ernest (1997) and Muriel (2004) and sister Audrey Jerger (2000). Mom loved many things in her life which included going for walks, watching sports, road trips, shopping, pets, but most of all her family. She lived. She laughed. She loved. The family would like to thank the staff at Bethany Care Centre for their care and compassion during her stay. In lieu of flowers, donations may be made to the Calgary Alzheimer Society www.alzheimercalgary.ca/get-involved/donate-now. My most sincere condolences on the loss of your mom. Cherish all the memories and know there will be another shining star in the skies. I am so sorry for your loss. No words or actions will make this pain go away but knowing your Mom is now at peace and is no longer suffering will give you a little comfort. She is surrounded by family who have treated her into paradise where pain and suffering are no more. Thoughts and Prayers on the Passing of your Mom, Doris was a Wonderful Lady and will be missed by Many, Thoughts and Prayers To All Families, God Bless You All. I am sorry to read of Doris’ death. I have many fond memories of her during my time at Bethany. She really had a beautiful soul and she will be missed. Keeping your family in our thoughts. Please accept our sincere condolence. Lisa, Don & Braydon: We were so sorry to hear of your loss. Thinking of you at this difficult time. Dear Mike,Daryl,Lisa and families. I am so sorry to hear of your moms passing.she was a great lady. love always bugsy. Dear Lisa, I was so sorry to have read about your mom’s passing, please accept my sincere condolences. I have lovely memories of your mom and use to like our little catch up sessions when she came home to visit her mom. Take care, Lori Sutherland. We are so sorry to read about your mom’s passing. Please accept our condolences. Ours thoughts are with you all at this difficult time. Mike, Daryl, Lisa & all of your families. Wishing you peace & love as you go forward in life. Knowing you all as we were growing up was truly a wonderful memory.. Was so happy to see your mom when she visited with Mike a few years back. We will always remember her wonderful smile & kind heart.